April Hot Topic: "You Get What You Pay For"
Our agency's gift to the volunteers is a letter, creatively arranged, having various quotes from staff and our executive director about the value of volunteers. We'll scroll these and tie them with a ribbon to make them look decorative. A wonderful keepsake to let volunteers know that they're valued. "Plant flowers in others' gardens and your life becomes a bouquet!" Society holds contradictory attitudes about money that affect volunteering in many ways. Susan explores some of the most common notions, from "if it's worth doing, it's worth paying for it" to "you couldn't pay someone to do this." How can we believe both that money equals worth and that money in some ways taints the receiver? Share how such preconceptions affect your work and how you combat them. Once again, Energize stays on the cutting edge and publishes our first Kindle book. 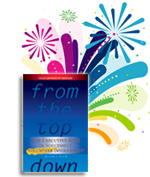 We announced last week that Susan Ellis's classic book, From the Top Down: The Executive Role in Successful Volunteer Involvement, has been fully updated and the 3rd edition is now available in paperback and e-book versions. So, if you've succumbed to the Kindle hoopla and have a device in your bag or briefcase, download From the Top Down (Kindle Edition) from Amazon today. Don't have a Kindle but would love an electronic edition of From the Top Down? No worries. We offer a straightforward PDF edition of the book in the Energize Online Bookstore. Read it on your PC or your Blackberry! Are you up-to-speed on what's new in the Everyone Ready� online training program? How it can help you -- and maybe all the people in your organization -- sharpen volunteer management skills? Do you know your enrollment options? Increasing volunteer participation is getting a lot of attention in many countries right now, and more organizations are trying to get up to speed with their volunteer management practices. Maybe the time is right for you to become part of the Everyone Ready learning community -- whether by recommending membership to your entire organization or choosing individual enrollment. We offer a new topic every month with high-quality online trainings by the top trainers in our field - you can access the resources at your convenience, as often as you like. To help you understand all the features of this special program, we invite you to sign up for one of the free conference calls we will schedule during the next month. To help us select days and times, please click here to express your interest in being part of a no-obligation call and your availability. To our international colleagues: Everyone Ready is ideal for anyone, in any country, willing to learn about volunteer management in the English language. We would be happy to talk with you, too, using Skype technology. So please also complete the sign-up form. One of the enduring mysteries of the volunteer management field is how often those who lead volunteer efforts do not build a team of volunteers to help them in their important work. Here we are, trying to get our paid staff colleagues to develop creative assignments for the right volunteers -- and being frustrated when we encounter resistance to this idea -- while we miss the opportunity to be role models in demonstrating how valuable volunteers are to building the organization's volunteer involvement strategy! Not to mention that we could be getting some great, talented, and much-needed help. How many volunteers now work specifically with me in coordinating volunteer involvement and do not hold any other assignment in the agency? Do I have a functioning advisory committee or management team to give me solid input and share the decision-making about volunteer involvement? Are you satisfied with your responses? If so, that's great! But if not, can you identify what has been holding you back from sharing your work with volunteers? Often the reasons will give you important insight into why other paid staff are reluctant to take a chance on donated talents. But you have no real excuse! Do a skills and interests inventory - who has additional talents you have not yet tapped? It is your goal to run the best possible volunteer effort for your organization to support its mission and expand available resources -- this is a vital role with which many people will be happy to help, if you ask.